I have 4 dogs and have been lucky enough to have Sunshine watch “my boys” for me for the past several years. She picks them up and drops them off when I get home, and I never have to be worried about the care they are getting. I would recommend Sunshine(and I have) to anyone in need of loving care for their animals. Thanks sooooo much Sunshine for keeping my boys happy and safe!!! Pampered Pet Sitters loves dogs, cats and all other animals. My home is their vacation. They will enjoy a large 5 bedroom home with air conditioning in a calm peaceful home. Daily walks are a must for our dogs and lots of love given to them as they hang out in the living room and kitchen and secure backyard. Get away in our beautiful cabin for your family & pets. Click here to see details. 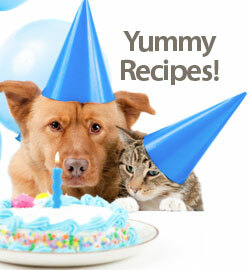 We've got lots of neat recipes for your loved one. Click here to check out how you can make your own.